Tagged with international schools, Nord Anglia. Further signs of the profitability of the international school sector have been highlighted by the recent stock market venture of Nord Anglia Education, which raised US$304 million in its initial public offering (IPO) on the New York Stock Exchange. 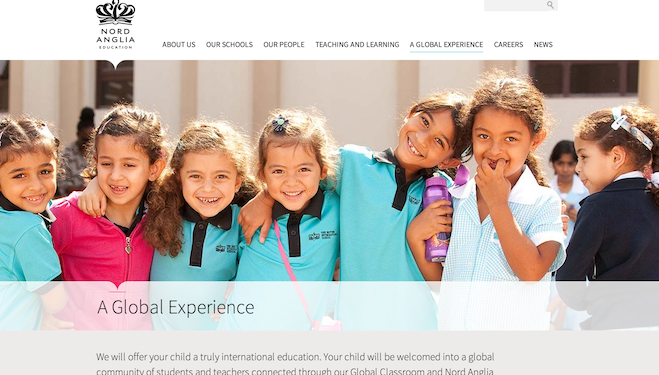 Extract from the company's website which advocates its "truly international education"
On March 26, the Hong Kong-based educational group offered 19 million shares at $16 each. By March 28, the share price had increased to US$19.67. The company says it will use the proceeds from the IPO, along with a $515m term loan, towards debts. Founded in 1972, the company was acquired by Baring Asia Private Equity in August 2008 for $360 million. In May 2013, it acquired rival international school chain World Class Learning and expanded its locations in the USA. Today it enrols some 17,000 students at its 27 schools across southeast Asia, China, Europe, North America and the Middle East. Tuition fees reach beyond US$10,000 per year for the premium school’s British curriculum which attracts wealthy local and international students. This September the group is set to open two more schools in Hong Kong and Dubai, two key markets for the international school sector. Last year, international schools generated US $34 billion in annual fee income according to the International School Consultancy Group (ISC). Within 10 years, ISC predicts there will be over 11,000 international schools teaching 6.3 million students globally.